Our marriage began with the best of presuppositions and from the start Elder Porphyrios, whom we often telephoned, told us not to avoid having children. A little later, after our child was born, we did not get along and we decided to get a divorce. We also had something against the Elder, may God forgive us. Instead of foreseeing our marriage dissolution with his gift of which we had personal experience, he encouraged us to have children. 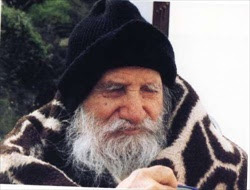 Three years before his death, Elder Porphyrios told us, "If you didn't have that child you would now be divorced and God only knows what would have happened to you. That's why I told you to have a child. You saved your marriage which is sacred, like all the Sacraments of the Church." He continued, "You'll create a happy family if you always think of this image which I'll now describe to you. Your child will hold each of you by the hand. He will walk ahead to show you the road and you will follow." A young lady, a friend of mine, was engaged. At one stage, some differences between her and her fiance cropped up. Neither the girl, nor her mother, who knew about the whole affair, told the father what was happening. At one particular moment, during the course of things, it looked like the engagement was going to be broken off. One afternoon, Elder Porphyrios called my home. I was absent at the time, he told my wife to tell me to go and see him as soon as possible. I went to the Elder straight away, who started talking about the girl's fiance, as soon as I went in. He started describing his character to me and telling me that he was a reliable fellow. I had no idea about the differences that the girl had with her fiance and couldn't understand why he was telling me those things. "Elder," I asked, "Why are you telling me this? What's happening?" He replied, "Her parents are a couple of egotists and they gave birth to another egotist. Instead of doing what she should do, before God, she judges everything in a worldly way. That's why she misunderstood certain things and is now ready to break off her engagement. Her fiance may have been a little misled by his family, but he's basically a good chap." When I returned home I called the girl's mother and the girl herself. I told them what Elder Porphyrios had told me. I asked them both to go and see the Elder the next morning and to talk with him. They went; the matter was sorted out, and the girl got married. She now lives happily with her husband and children.